The New User dialog provides the ability to add a new user to gain access to basic functionality in the application, as well as personalized/customized layout and settings. 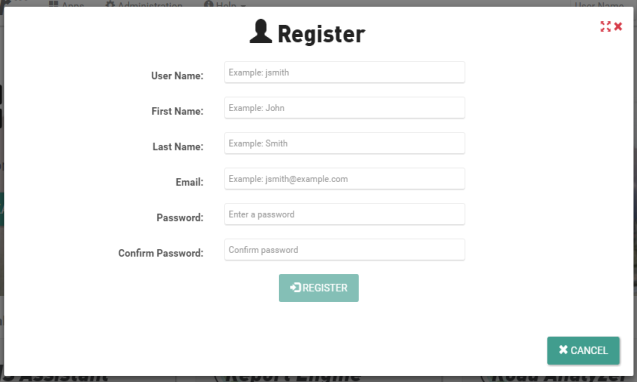 Administrators, or others with the privilege, can also register a new user in User Roles. Heads Up! If Windows authentication or Security Token Service (STS) is the chosen security setting and you are part of an Active Directory or other STS you will not need to register as a new user. When you are already signed in on an Active Directory or STS network, App Manager will pick up your credentials and automatically sign you in. Click Register from the dropdown menu. Fill in User Name, First Name, Last Name, Email, Password, and Confirm Password. Tip: Make note of your User Name and Password for future use.